Tween Tuesday is a weekly meme that features reads for tweens! 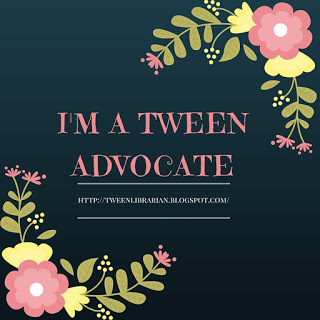 Join in the fun and post your own Tween Tuesday post and leave a link in the comments. About the Book: Lydia and Julie are not popular so these best friends decide to figure out what makes popular people so popular in the first place. The girls plan out different experiments and keep track of their results and observations in a notebook which they share. As the girls undergo their popularity research, they find themselves less popular, in trouble, and drifting apart. GreenBeanTeenQueen Says: I picked this book up because it was sitting on the new shelf in the children's department at my library and I was looking for good booktalk ideas for fifth and sixth graders. This book is another great addition to the comic-type books that are popular with tween readers. 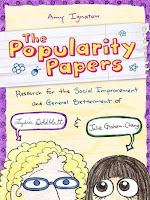 Lydia and Julie's observations about popularity are humorous and will resonate with tween readers. They beg for cell phones, aren't quite sure about their feelings on boys-gross or cute, Lydia auditions for the school musical. They think their plans are great, but things don't always go as they thought and readers will love reading about their mishaps. Lydia is outgoing and wants to be on stage, Julie is shy and more of a tomboy. I think readers will also relate to the way friends can change in the tween years and start to grown apart. Lydia and Julie are perfect examples of tweens-how every day can be filled with drama and emotion, friendships change, you can discover new hobbies, and you become more independent-and that's OK. The artwork is fun and bright and colorful and is a change of pace from the black and white filled comic books. The book can be somewhat hard to read at first because it's written in the girls handwriting. I also thought the story was a little too long and while it's funny, I didn't find it as laugh out loud hilarious as other reviewers have. But tweens will love it and will be nodding their heads in agreement with Lydia and Julie's commentary on tween life. The Popularity Papers is a must add to any school or public library collection with a strong comic readership. 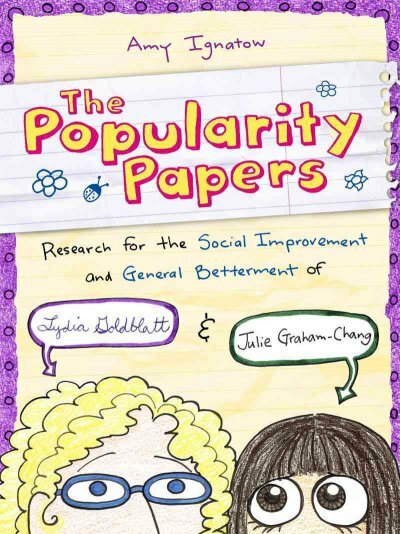 I like the idea behind this book - an experiment to see why popular people are popular? Very cool. Here's my Tween Tuesday post. Here's my Tween Tuesday: Hatchet. I have missed too many weeks! This looks like a great tween book! The tween years can be hard on childhood friendships.